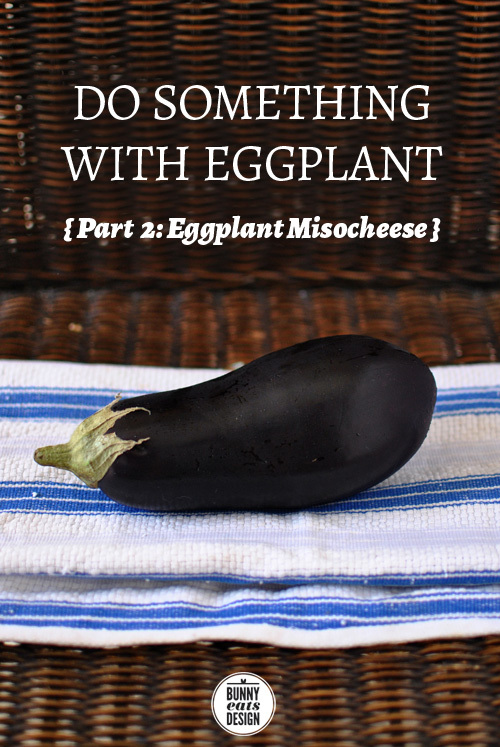 A couple of years ago I tried to conquer my most loathed vegetable: the eggplant. The slimy fruit of nobody, I never thought I could like it. I grilled it and paired it with orzo salad and we ate it for dinner one night. The Koala left most of his eggplant on his plate. He wasn’t a fan either. I thought I had cooked it correctly but the evidence was clear. Eggplant 1, Genie 0. Your comments told me that I should give eggplant another chance (at some stage). Let’s call that experiment Part 1. Two years later, I have a different view on eggplant. Let’s call this Part 2. A few weeks ago, a group of us dined at Nishiki in Freeman’s Bay. I was delagated the pleasure of ordering for all (one of my favourite pastimes). One of Nishiki’s best dishes is the Bei-naso Misocheese (eggplant miso cheese) and I ordered 3 for the table. $9NZ for half an eggplant may seem steep but if you’ve ever tasted it, you’ll agree that it is divine. Savoury, sweet and covered with melted cheese. My favourite way to eat eggplant. Eggplant is currently in season and a whole eggplant is $2 to $4NZ. Since The Honesty Box delivered an eggplant, I decided to put on my big girl pants and revisit the eggplant. I had to recreate Bei-naso Misocheese at home. Because I am cutting back on sugar, I used honey but you’re more than welcome to substitute sugar. I studied a bunch of recipes for similar eggplant dishes and came up with this beauty which comes very close to Nishiki’s version. I’ve made this a bunch of times over the last 2 weeks, fine tuning the recipe as I go. You can trust me when I say this is awesome. I thought I didn’t like eggplant, but I love this. This recipe can easily adapted for more eggplants. I have used large Western style eggplants, but if you are using the more authentic slender Japanese eggplants, you may shorten your cooking time. Though eggplant seems to be one of those things that benefits from overcooking. Turn on your oven to 180°C or 355°F. Cut the top off the eggplant and cut it in half vertically***. To stop the eggplant halves from wobbling on their round bottoms, carefully cut a thin slice from the roundest part of the back of each piece. This will give the bowl a flat base to rest on. On the inside cut side, make diagonal slits about 1 cm deep and 1 inch apart so that the entire cut surface is scored. This will allow the glaze to soak through the top layer. Lightly brush both sides side with oil and bake scored side up for 15 minutes. Mix the ingredients for the miso glaze in a small bowl until smooth. Set aside until required. Remove eggplant from oven and brush the scored side of the eggplant with half of the the miso glaze. Return to bake for 15 minutes. Remove from oven and brush with the rest of the miso glaze and then top with grated cheese. (If cooking ahead, at this stage you can then cover with a tea-towel and set aside until dinner or refrigerate, otherwise…) Return to bake for 15 minutes until the cheese is bubbly and golden. Serve with rice, salad or other Japanese dishes such as noodles or gyoza. *** For a party or a pot luck, you could cut eggplant into 5-6 rounds. Think: chocolate log. Miso is a healthy umami hit. A source of anti-oxidants, vitamin B12, amino acids, beneficial enzymes, protein and tryptophan, miso is also alkalizing, anti-cancer, good for the heart and protects from radiation. 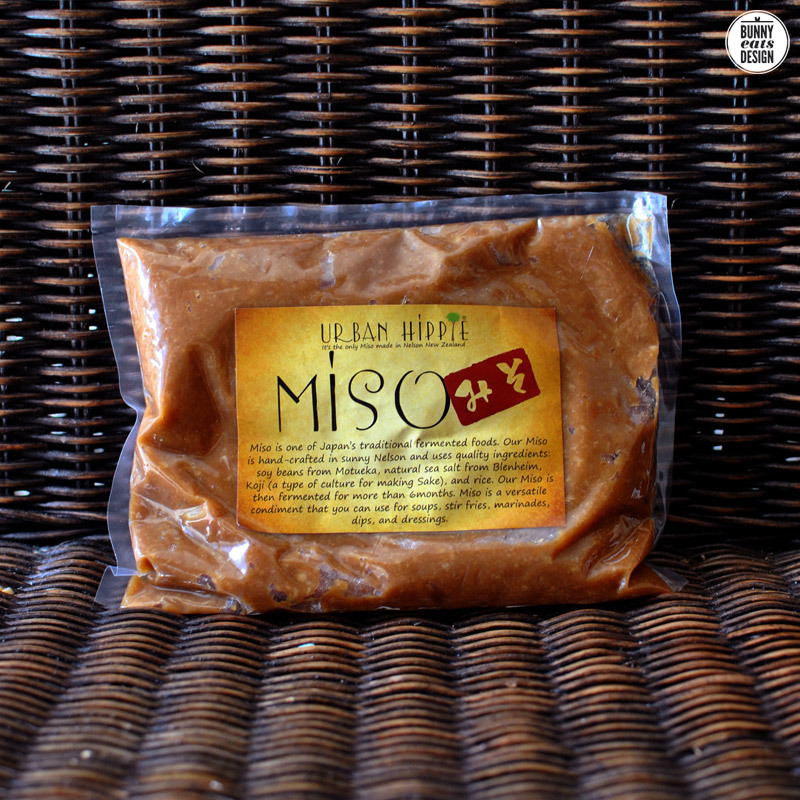 The miso I have used is by Urban Hippie and is the only miso made here in New Zealand. It is MSG free, GMO free and naturally gluten free. Miso is often used in place of salt in Japanese cooking, as I have done here. I bought it at Little Bird Organics in Ponsonby. You can find a list of stockists here or buy online. Unlike some other miso I have tried, this is not salty which makes it nice addition to many dishes. The only gripe I have with this product is that it comes in a bag, while their other products come in a jar or bottle. A jar would be great as a bag is quite impractical. I’m pretty sure no one really uses the whole bag in one go. I am no longer scared of eggplant. Eggplant 1, Genie 1. Maybe eggplant also wins this post. Glad you made it into the world of eggplant lovers. 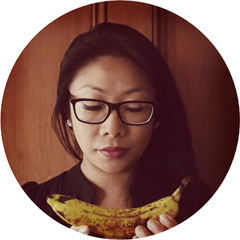 I was the same at first, until I had Szechaun eggplant. Besides that there is eggplant parmigiana (like lasagna but the noodles are replaced by eggplant) and my fave Baba Ghanouj, a lovely garlickly, burned eggplant spread. Very tasty. I’m sure you’ll try these experiments, being such a foody. Cheers! Yum! 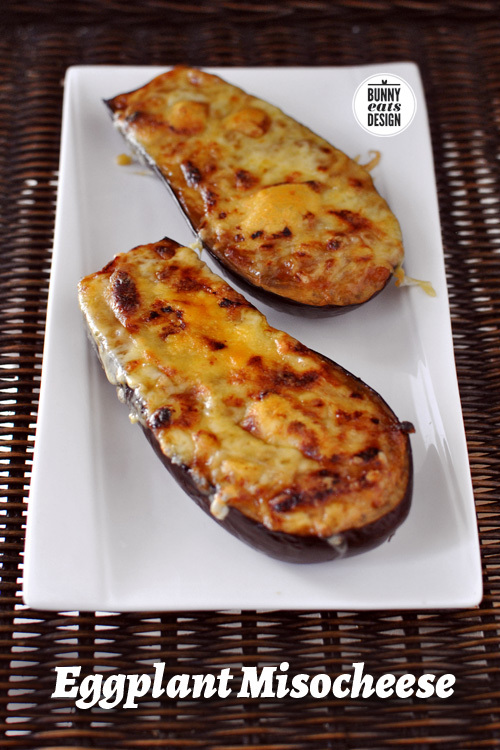 I actually like eggplant but what a great way to prepare it that I haven’t tried! Will have to give it a go 🙂 I’m also a big fan of baked eggplant Parmesan – if you haven’t tried it that way you might like it. 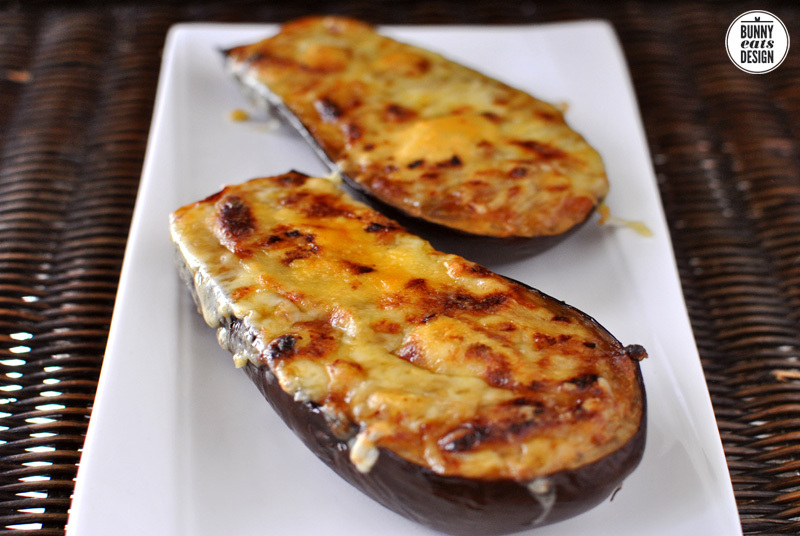 Love the use of miso & cheese! I’ve often had domething similarly grilled on shellfish, also secretly good. Yum! I like eggplant but it took some time. Indian recipies are often excellent. My favourite is Madhur Jaffrey — The Lake Palace Hotel’s Eggplant cooked in the Pickling Style . One day I will got bck to Udaipur and stay at the hotel. It’s my least favorite vegetable too. Well, OK, if you forget about beets which I also find revolting. I do like eggplant the way my husband’s family cooks it: sliced razor thin, dried, then breaded and deep fried. What’s not to like? Oh, yeah, and I like Japanese eggplant in miso. So… clearly I need to try this recipe! Yum – this is one of my favourite dishes at pretty much any Japanese restaurant! You need to try caponata. A Sicilian sweet and sour eggplant number. Great with lamb or fish or on a piece of bread in your face!! Ooh, what a great way to prepare eggplant! Interesting – never would have put miso and cheese together with it, but there’s not much that can’t be improved with cheese melted on top. Thanks for sharing, will give it a go! JT would love this dish and he doesn’t love eggplant. It looks absolutely moreish. Even the Koala ate all of these! I don’t know if they are super good for you. I’ve never heard anyone say you should eat more eggplant. But they are cheaper than boots. I know what you mean though, what is the point of forcing down something unless it is super good for you right? I think for me, it’s about conquering demons and shortening the list of foods I don’t like.